Transwave Communication Systems Inc. is investing at least $500,000 to upgrade technology infrastructure at Victory Technology Center in Lackawanna. Clarence-based Transwave is making the investment to build a reliable back-up location and better serve customers. The 23-person company, founded in 1993, specializes in microwave, data networking, telephony, tower construction and site development. Industries they serve include transportation, utilities, public safety, municipal IT, health care, homeland security, military and education, to name a few. Victory Technology Center, which opened in 2012, is operated by Catholic Health and is located at the former Our Lady of Victory Hospital. Besides Transwave, other tech companies use the data center to provide co-location services. Transwave Chairman Martin Renzoni said that the investment could total $750,000 when finished, and is mostly internally financed. 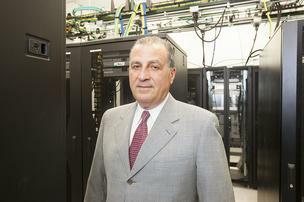 Funds are being used to build an IT infrastructure in Lackawanna. The Lackawanna site will serve as backup, mirroring the company's at 9020 Wehrle Drive, as well at its co-location facility at 350 Main Street in Buffalo. "Besides being resilient and redundant, the Lackawanna site gives us greater reach as we expand our network outside the area," he said. The company's broadband service provider network is located at 350 Main Street in Buffalo. From its Clarence headquarters at 9020 Wehrle Drive, the company runs its warehouse, sells technical services and manages network operations. "The investment is to bring our network into the site," Renzoni said, adding that two of four segments of the build-out have been completed. The final two, which will include installation of fiber and wireless interconnections, should be completed this summer. "These elements can be layered on without any interruption of service," he said.